The task of the Holy Spirit is to make Christ present in us, and to make us understand what not even the disciples could have understood about Jesus while living with Him (cf. Jn 15 :26; Lk 24:16,30,31). For a Christian the experience of the Holy Spirit moves on two prospective, which are apparently opposite, but profoundly united: his revealed reality as the third person of the Holy Trinity, and the power which leads the faithful to spiritual1ife A very slim, almost confusing distinc­tion between the divine and the human spirit. 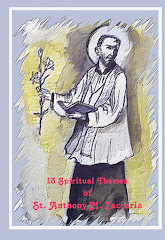 This helps us to understand the two levels on which St Anthony M. Zaccaria moves in his reflection; the reception of the Holy Spirit and spiritual life. True spiritual life demands from us to move toward God or better to become the same with Him, since Christ lives in man and his soul is governed by the Spirit of God (cf. The Writings, 83, 71). There is already some clarification in that "confusion" often made between the human and the Divine spirit, between natural instinct and "instinct of the Spirit" (terminology St. Anthony Mary takes from St. Thomas); there is already an outline of a most common question: how much is my human spirit of an obstacle to the action of the Divine Spirit, and how to preserve my freedom. In his Letter XI to the Omodei couple, St. Anthony Mary invites them to develop those qualities they have through the merits of Christ Crucified (didn't Jesus give up his spirit on the cross, and are not the virtues the fruits of the Spirit? cf Jn 19:30; Gal 5:22), so as to move on the road to perfection and sanctification. It is the Spirit to gradually lead toward sanctification, overcoming the obstacles which try to freeze the natural instinct at the lowest levels of perfection, stemming from the conviction that it would be enough to honor God only up to a certain degree. "The man who wants to go to God has to go by steps" (Sermon I). It is the Spirit to inflame Anthony Mary and to make him write in his Constitutions, "Rise as much as you can, because you are more and more a debtor! Rather, never let anyone ... think to have done much ... “(p. 183), the Saint affirms echoing the words of his master Fra Battista: "More virtuous is man in his life, more gifts and graces he receives from God, and receiving them he becomes more and more a debtor. So acting with fervor he receives a new grace, without which he could not operate. Therefore, operating well, the debt increases" (Specchio Interiore, 52v). To deepen the role of the Holy Spirit in spiritual life, we have to make reference to Sermon II and more specifically to Letter V of June 26, 1537, vigil of Pentecost. Anthony Mary talking of the Holy Spirit "distinguishes" three aspects: the biblical, the personal, and the tradition of the Church. After having presented spiritual life as an unceasing thinking of God, and having affirmed that every action should start with the invocation of God's name, he notes, referring to Rom 8: 16, that God's Spirit guides the soul just as the soul guides the body In fact, the Holy Spirit is "the teacher of justice, of holiness, of perfection" (Letter V), the master of spiritual life. He is a master who stays always with us (cf Jn 4:29), who guides us in the full understanding of revelation and makes us true witnesses of Christ. 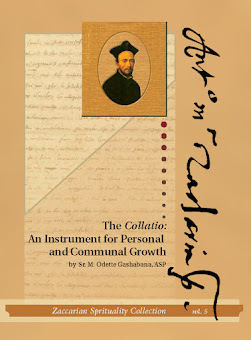 At this point comes the most personal and original reflection by our Holy Founder, as a disciple of Fra Battista, affirms how the Holy Spirit gives us the fullness of rest, which is the destiny to which God has been calling man. 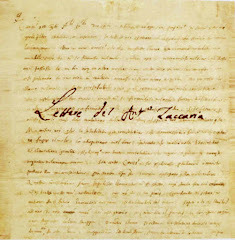 A rest which is "an eternal tranquility (in the shadow of the infamous cross)" (Letter V), a total victory over oneself through the cross which is nothing else but a life of virtue under the guidance of the sublime "virtue of the Holy Spirit" (Constitutions XII), as he will teach the novices, "The Anointing by the Holy Spirit will teach you every­thing and will take care of you" (Ibid., 191) . Therefore, man must be able to discern in himself the vivifying presence of the Paraclete; only then can we say that he has acquired that "instinct of the Spirit," which will protect him from making a mistake, "because the Holy Spirit goes immediately to the very bottom of things" (Letter II). In fact, "the Holy Spirit will not allow you to err" (Letter V) .